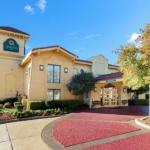 The freebies include Wi-Fi breakfast and an outdoor pool at La Quinta Inn Bossier City near the civic center and mall. Each of La Quinta's 130 rooms set on two floors includes free Wi-Fi a flat-panel TV and coffeemaker. Fill 'er up at the complimentary continental breakfast and then make a splash in the outdoor pool. A guest laundromat helps long-term guests look their best. Pets are welcome and parking is free. Just off I-20 La Quinta is one mile from the civic center and two miles from Pierre Bossier Mall. It's four-and-a-half miles from the Barksdale Air Force Base and two miles from the slots at the DiamondJacks and Horseshoe casinos. A six-mile drive gets you to Harrah's Louisiana Downs and the Louisiana Boardwalk. Top Shreveport Attractions â?? including the planetarium at Sci-Port convention center Barnwell Garden & Art Center and the Red River Entertainment District â?? are 10 minutes west. Shreveport Regional Airport is 10 miles away. One dog up to 20 pounds is allowed. There are no additional pet fees. Dogs must be leashed, cleaned up after, and a contact number must be left with the front desk if there is a pet in the room alone.